Finance minister says from Davos that what happens in Brazil will be key to Argentina's immediate economic outlook. Finance Minister Nicolás Dujovne estimated today that the economy shrank "by around two percent" in 2018, while reiterating the importance of Brazil's economy to Argentina's ability to rebound from recession. 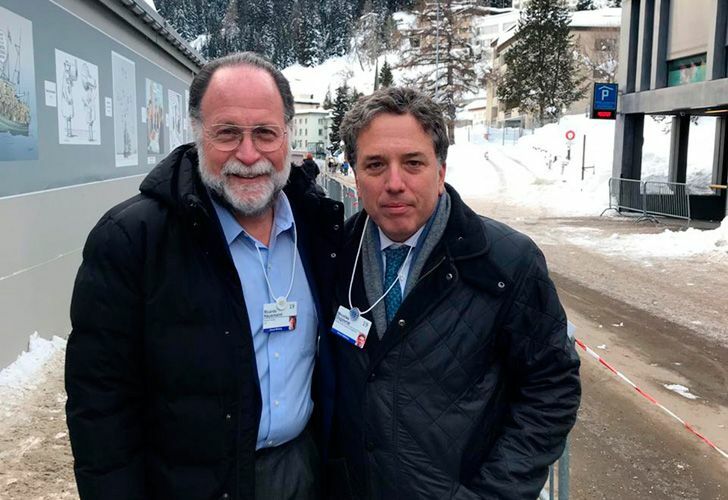 "What happens in the country [Brazil] is very important," he said, speaking at a press conference at the World Economic Forum in Davos, Switzerland, accompanited by Central Bank chief Guido Sandleris. Questioned about Argentina's economic output last year, Dujovne said that that government was awaiting confirmation of the impact of the recession on GDP. "We do not have the data for the fourth quarter of 2018 – the numbers have not yet been published – but Argentina faced a GDP contraction during that year of around two percent," he said. "The biggest drop in GDP in Argentina occurred in the second half of last year," Dujovne added, arguing that a brighter outlook lay ahead. "The message I want to send is that the shocks that we suffered in 2018 reinforced our government's commitment towards reforms," he said. "So we decided to accelerate the path toward fiscal balance." The finance minister said that "there is growth in the world," tying Argentina's immediate outlook to its giant neighbour and its new leader, Jair Bolsonaro. "For Argentina, what happens in Brazil is very relevant... it is a very important commercial partner for Argentina." Dujovne also took time to praise Sandleris, saying that new monetary policy was delivering "stabilisation, [with] inflation slowing and variables [that] are stabilising." However, he added that "rapid growth will not be seen in 2019." Argentina's economy will recede 1.7 percent in 2019 and only in 2020 will the economy begin to bounce back from its current growth woes, hitting 2.7 percent, the International Monetary Fund predicted earlier this week.